The colours of blue and gold, a personal preference of Her Honour, refer to the waters of New Brunswick and the wealth that comes from the land. The mirror imaging of the colours and elements depicts Her Honour’s dual Royalist/Rebel heritage from the 1760s and 1770s in the Cumberland region and at Fort Beauséjour. The orle with the scalloped edge is found in the Scottish heraldry for Norries, her paternal line. The four coronets symbolize Her Honour’s four children, and, by extension, the central place that her family plays in her life. The coronets themselves are a new symbol in heraldry, using the fiddlehead frond to convey Her Honour’s many connections and years of service in the province of New Brunswick. The coronet of maple leaves honour Her Honour’s position as Her Majesty’s representative for New Brunswick. Her Honour’s maternal family, the Fawcetts, are traditionally represented in English heraldry by a lion. 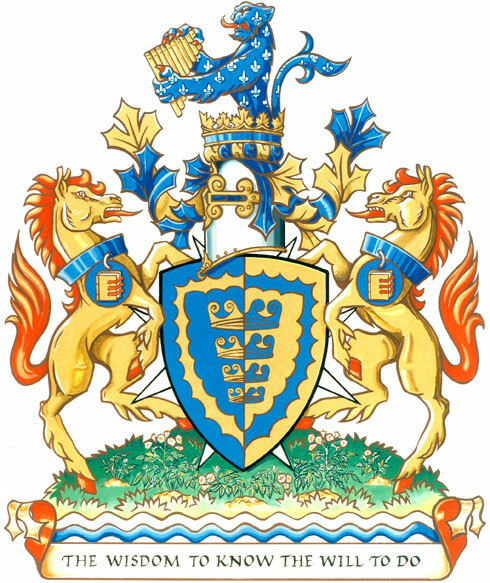 The lioness in the crest serves a dual purpose: it commemorates Mrs. McCain as the province’s first woman lieutenant governor, and her mother’s service as a Senator. This animal’s strength and power represent Mrs. McCain’s spirited engagement in the fields of education and social policy. The lioness is spotted with fleurs-de-lis denoting Quebec, her birthplace, and the pipes of Pan reveal her musical interests. The mares emphasize that these are the arms of a woman and recall Mrs. McCain’s farming heritage in Nova Scotia. The medallions hanging from the collars feature books, which symbolize Her Honour’s involvement in education, especially as Chancellor of Mount Allison University. They also communicate her belief in the importance of learning and its role in assisting change. The mares stand on a field garnished with potato plants, which is a metaphor for the McCain home at Florenceville on the Saint John River. The potato plants are in honour of Mr. McCain’s entrepreneurship, arising originally from the riverside potato farms. THE WISDOM TO KNOW THE WILL TO DO.